Back when Musicland still existed, they used to have a free magazine sitting out on the counter of their stores in the mall. Actually, maybe they were free with purchase. Either way, it was called Request, it looked like this, and I used to get them whenever I could. The thing should have sucked (It was Musicland propaganda, after all), but it actually didn't. Well, it depended on the issue. But, really, it was like a slightly less legit version of Spin, and for a kid on a limited budget - teenage me, for example - it was a great resource for reading about music. 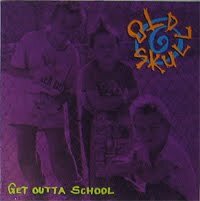 In one issue that I must have picked up in 1989, there was a full-page photo and a short little blurb about a band called Old Skull, a three-piece punk group whose members weren't even teenagers yet. The picture was sweet, and of course I can't find it anywhere on the web. Anyway, I was never intrigued enough to actually buy the album, but my brother was, and he picked up their tape at some point. Upon hearing it, it became clear that they weren't much more than a novelty act, but it had some fun points. But, I never really got into it. I found this LP at the record show I went to a while back, and I picked it up. I don't plan on listening to it much, but it's a nice one to have. I had that picture from the magazine on my wall for years. I used to really want the drummer's George Hurley haircut. I don't recall when I finally got the cassette but I can recall being shocked at just how bad it was. I knew they were just elementary kids and all but jeez, it's just them banging on their instruments and yelling. That's not to say I didn't listen to it quite a bit but it's really a pretty rough listen. A few things that I find odd. Why did they put 15 full songs on it? It would be much more tolerable at 10, especially since the songs are pretty much indiscernible from one another. Also, I dare you to point out where you can hear keyboards on this thing because I certainly never have. I have always wondered if they just unplugged that kid's keyboard during the recording and they never told him. Another thing I love is that they actually printed all of the lyrics. "Kill A Dead Eagle" is like reading a modern day Robert Frost. They had a follow up that I could never find called "CIA Drugfest" or something like that. I think it was supposed to be actual songs. Someday I'll track that down.